Several years ago a friend of mine found an abandoned kitten. She took him to work with her every day because he had to fed often and couldn’t be left alone at home. Everyone loved coming over to see Otis. He was adorable and would fall asleep in the oddest places. One day though, someone complained about Otis and that was the end of that. My friend had to start making trips home at lunch to take care of him and most of her coworkers were sad that they no longer had Otis to pet and cuddle with once in a while. 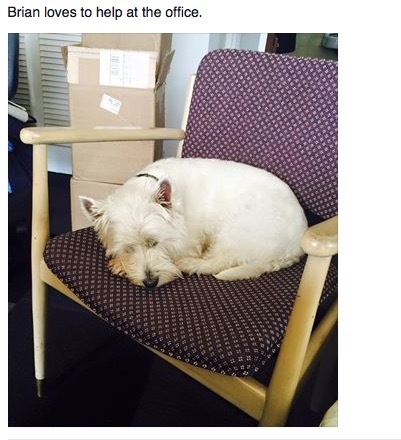 Still, it’s not uncommon at this friend’s workplace to find a dog or two once in a while. If someone’s pet has been to the groomers and they don’t have time to run back home, the pet comes back to work with them. Everyone seems to enjoy being able to go pet a puppy! Who wouldn’t love the stress relief from that? The problem, though, is that there are many people who are allergic to pets who certainly don’t want their day at work interrupted by fits of sneezing and watery eyes. There are still others who think that pets at work are purely a distraction. Decisions have to be made on a workplace by workplace experience as to whether pets can be allowed or not. This is definitely an advantage of working at a small business or one that is geared towards pets! 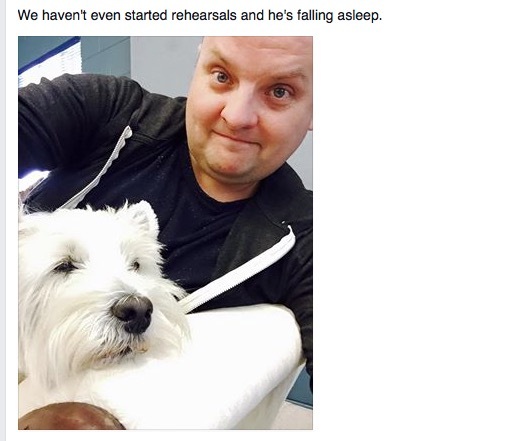 One friend of mine who works in the theater takes his dog, Brian, to work with him almost every day. 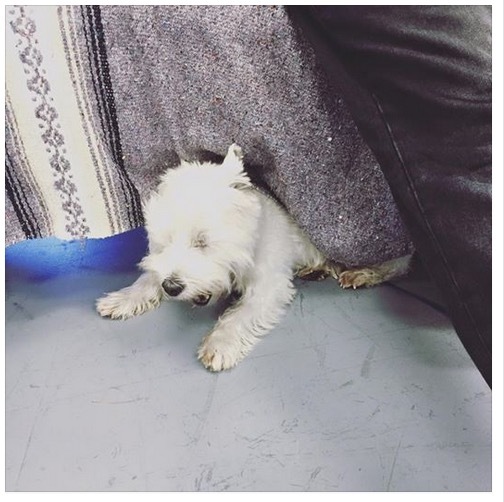 Brian is a Westie and I love seeing the pics of him at work with his owner. So to all of you who are able to take your pets to work, bravo! Do it! You’ll brighten a co-worker’s day. For those of you who can’t take your pets to work, here are a few pictures of Brian to make your day better.